Online photo sharing websites are very cool. They're a great way of being able to share with your friends and family your adventures, holidays, events and special occasions without clogging up everybody's inbox with photos they may not want to see. Let's face it, not everybody will be interested in photos of my holiday to Germany next week (Dusseldorf just in case you're wondering) and they might not have the time to wade through all the photos anyway. It's much better to put them online then so people can go to the photos only if they actually want to. There are a great many services available including, to name just a few, Facebook, SkyDrive, Flickr and Picassa. But what if you want to put photos online that aren't for sharing, and are just for personal access or storage? This can be more of a problem because by default these websites (with very few exceptions) will assume that you're putting photos online because you 'want' to share them with friends and family. Examples of photos that you might want to keep private include the full unabridged copies of your holiday photos, including all the ones of the drunk idiot, and perhaps insurance photos that you want to keep in a safe place away from your home in the event of fire. In this tutorial I just want to talk about Microsoft's SkyDrive as this this service will be integrated into Windows 8 making it easy, or at least easier, to upload photos to the service and it is one of the photo sharing services already built into Windows Live Gallery. The other reason I want to highlight SkyDrive is that this service is one of the worst offenders, assuming that any and every new photo gallery you create is to be made public. Your SkyDrive service is linked directly to your Windows Live Account, and you can link your Windows Live account to many other accounts including Facebook, Twitter, LinkedIn, Flickr and more. You could then suddenly find your personal photos scattered right across the web without you realising it. To make sure you have your settings set appropriately you need to log into your account at SkyDrive.com and in the top right click on the Profile link. Once in your profile page click on the Privacy Settings link (see 1 and 2 in the screenshot above). The default settings in SkyDrive don't allow you to make everything completely private, which can be annoying if you only use the service for storage as I do. At the next screen you'll want to click the Advanced settings link near the bottom of the page, just next to the Save button. 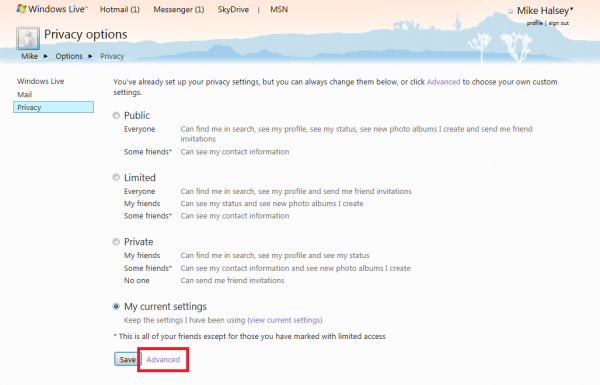 This will take you through to another page where you can set absolute privacy rules for everything you store on SkyDrive, including your photos. The most important setting here is the one labelled New photo albums. You will probably find this set to Some Friends or Friends by default. You'll want to take this setting down to Just me instead. The setting for New file folders should already be set as Just me but it is worth checking. Below this are additional options to modify the privacy of folders you have already created. You should press the Save button when you are finished. You can also do this in the main SkyDrive view. When you holver over a folder a blue information icon will appear on the far right of the screen (see image above). If you click on this it will display a sidebar of additional options for that particular folder only. Here you can also change the sharing settings for that folder by clicking on the Edit permissions link. You can send people a link to photos stored here too if you want to share the contents of the folder. 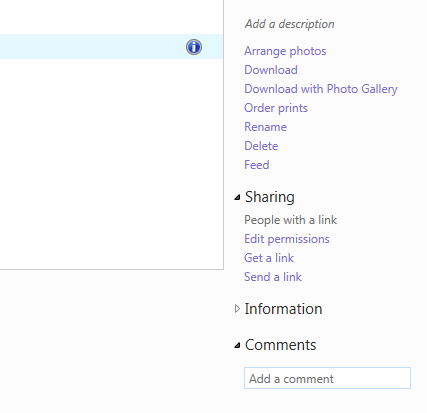 It's is very important to remember to change the folder sharing settings before uploading photos to the folder! If you do this afterwards, you could find that the images have already been shared with other websites. This means that those websites, rather than having a link back to the photo on SkyDrive, may pull the photo down and store a copy locally. It is disappointing that some services, and of course I'm singling SkyDrive out here for particular attention, don't offer you better privacy controls when you first create a folder or upload photos. They may offer this in the future, but for now this is how you can keep your photos and files safe and secure. Every so often, I will create a zip file of my photo folders and then upload them to Google Docs. You can upload a file up to 1 GB, so it’s the perfect solution (for me, anyway) to securely backup my pictures in the cloud. I do the same thing with music files, too.